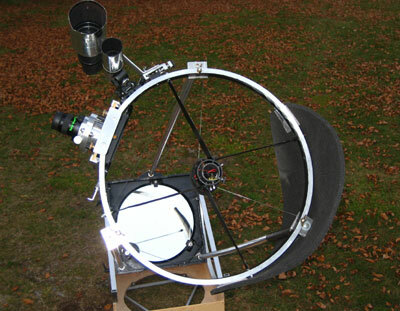 After having completed my 22" Lowrider Dobsonian, I wanted to re-design my 14" Dob built in 2003 into a compact ultra light travel Dobsonian. 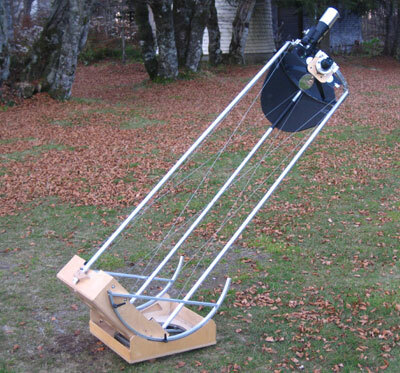 The 12" travel Dob made by Ulli Vedder set a benchmark for this kind of telescopes. 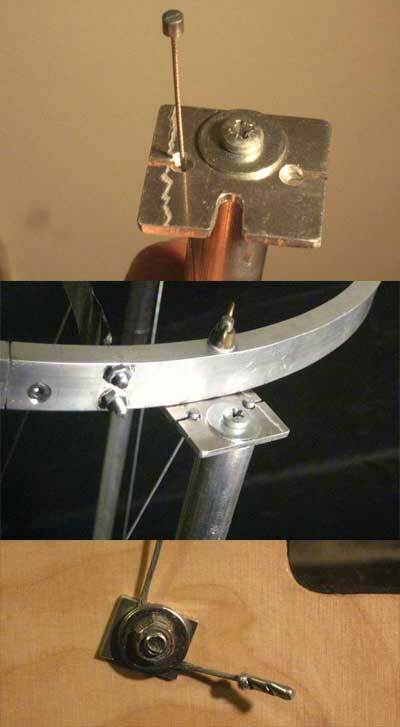 I have used many of his ideas when building my telescope. In order to reduce the number of poles, I designed it to be a string telescope with three poles that need to have a somewhat larger diameter than in a conventional truss. The poles are stabilized by pairs of thin strings (bicycle gear cables). Both the string design and the conventional trusses have their pros and cons, but the string design was something new and I wanted to give it a try. Pros and cons of a string design: With a string design, the telescope may by build in a most compact way. There are only three poles, which can be easily made in a compact split design, as there are no pull forces acting. On the other hand, the poles and the strings never are in a single plane. Therefore, the poles will slightly bend as soon as the strings are tensioned. The telescope is therefore not as stiff as a conventional truss and vibration dampening is slower. Such a compromise would be tolerable for my travel dob, but not for my main telescope. More about planning and making of big Dobs is on these pages. The poles are made of 20 x 1.2mm alloy tubing, which are inserted into fittings at the mirror box (no clamping needed). As the poles have to take also some bending forces, they need to have a sufficiently large diameter. The poles can be split into halves of 85 cm length and have adjustable stops at the end. For the strings I used bicycle gear cables (1.2 mm). 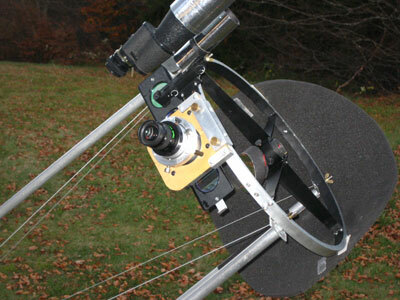 The small fittings at the end of the cables can be inserted into small slots at the endplates of the poles, which allows rapid and easy set up of the telescope. At the mirror box, the cables are clamped between two hard steel washers (should be quite thick to avoid bending) and a small piece of softer alloy. This proved to be very stable and I did not need to re-adjust the strings up to now. the upper ring is attached to the poles, which puts the string/pole system under tension. 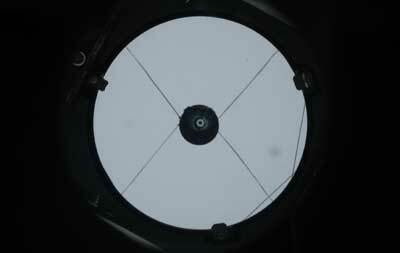 Looking through the focuser, you will notice that the two strings at the front side slightly cross the light path (at the lower right in the picture). This can be avoided by attaching the strings to the middle of the sides of the mirror box, which on the other hand sacrifices stability. By the way, very similar problems easily arise also with 6 pole truss frames (which are then, however, at least 10x thicker than the strings). ... is made of plywood of 15 mm thickness (bottom) and a 12mm sandwich construction (sides). 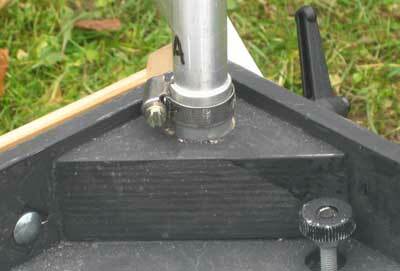 The ground board was reduced to a triangle of 10x10 mm alloy square tubes with removable stands. 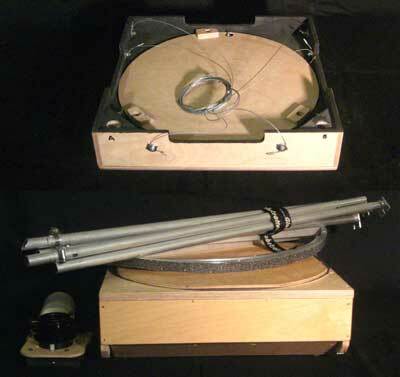 ... is made of 9 mm plywood with an 18 point mirror cell in triangular shape made of square alloy tubing (similar as in my 22" Lowrider Dob). 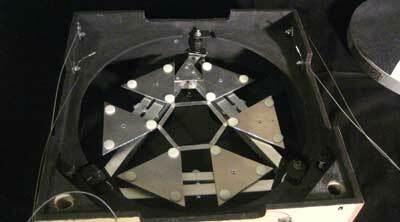 The mirror travels together with the cell during collimation and the collimation screws are accessible from the top. The screws can rotate freely in fittings at the corners of the cell. The wooden blocks at the sides of the mirror box contain threaded inserts. Lateral support is achieved by small blocks with teflon, which proved to be sufficient for the 33 mm thick mirror. 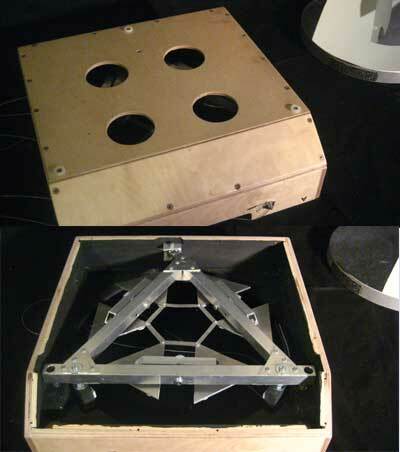 The mirror box is closed at the bottom for improved stability, such that no further cover is needed for transport. The mirror can be tightly locked in the mirror cell, making the telescope, allowing to take the telescope along as checked-in baggage in air planes (see also Ulli Vedder's mirror lock). This is achieved by the mirror cover that can be screwed onto lateral support pins of the mirror cell. For this purpose, the mirror clips are removed and instead small wooden wedges glued to the mirror cover push against the mirror's bevel from top. 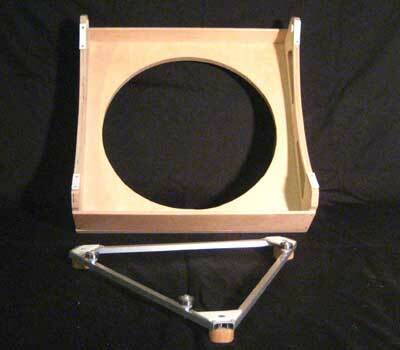 ... are made of 20x10x1.5 mm square alloy tubing and bent in a vice using wooden templates. ... is likewise bent from 20x10x1.5 mm square alloy tubing. 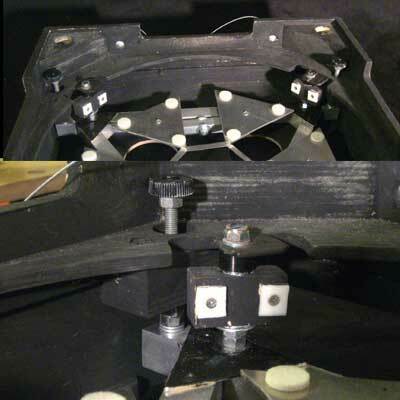 The focuser can be removed, likewise finder and secondary mirror. There further is a light baffle at the focuser and a filter slide. The string framework is very sturdy. 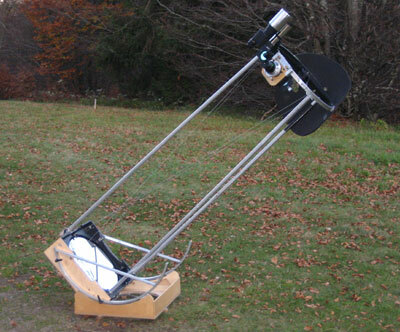 The Dobsonian can be held at a single pole and be carried around. The telescope keeps its collimation in all positions and surprisingly needs only minor re-collimation after each setup. The telescope ready for transport. In the beginning I expected the strings to cause a mess, which is, however, not the case at all. Everything is very ordered and the strings do not get entangled. The mirror cover is shown here in the "normal" mode. For locking the mirror in its cell, it will be flipped over and screwed onto the cell. For transport, the upper ring, finder, and ground triangle can be stored in the box, with the rocker box serving as cover. Poles (85 cm), focuser, secondary mirror, and altitude bearings are stored separately. 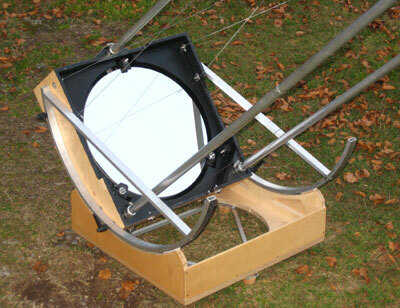 The telescope weighs 16 kg, of which 7.3 kg are due to the mirror. The box measures altogether 45 x 45 x 16 cm.